Start everyday beautifully with plantation shutters. 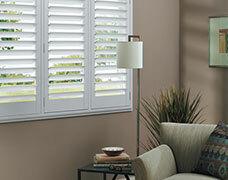 Plantation shutters are an elegant and timeless choice for window treatments. We offer a variety of plantation shutters in your choice of materials, colors and slat sizes. 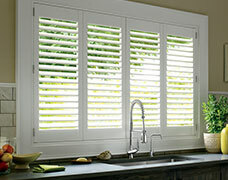 Hunter Douglas Plantation Shutters are designed and hand assembled in the USA from quality materials. Each shutter is carefully constructed to the last detail for quality and durability. Our plantation shutters come in three materials: genuine hardwood, composite wood and vinyl. Wood shutters can be painted or stained any color, making them a perfect choice for matching your wood furnishings. Faux wood shutters work best in areas of high traffic or high heat and humidity. They make an excellent choice for kitchens and bathrooms. 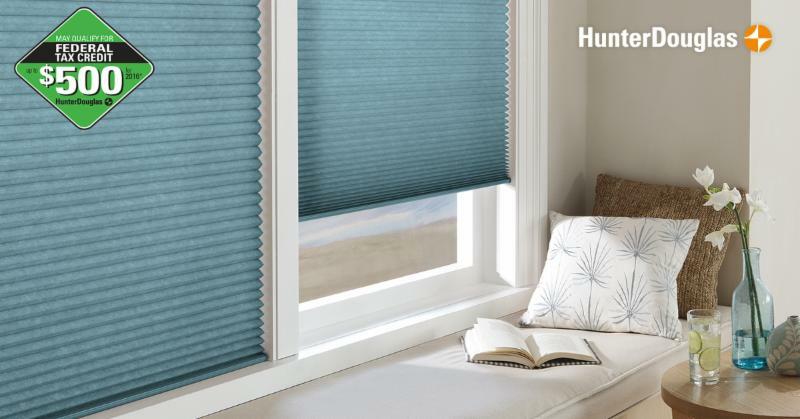 Our window treatment specialists can help guide your decisions based on the design of your home and everyday living. 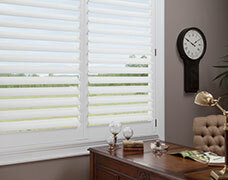 Plantation shutters are one of the most versatile window treatments available. They can fit every window size and shape and look amazing in arches and circle windows. Surprisingly, they are one of the most energy efficient window treatments when closed. Plantation shutters fit closely in the window frame or can be mounted outside the frame. Because they can be designed in a variety of ways, they are able to hide unsightly window frames or architecture. Plantation shutters will add value to your home and provide you with years of enjoyment. Shutters naturally add a warm feeling to your home and create crisp, clean lines. You can use plantation shutters by themselves or add a window treatment like side panels. They can also be mounted stationary, or open and close from either side or in the middle. Hinges can be placed on any side of the shutter for added style. You can also hinge panels together and open them like a fan. For sliding glass doors, our sliding track system allows you to open your shutters in the same way the door opens. Plantation shutters can fit a multitude of windows and doors so that you can easily cover every window in your room. If you are interested in plantation shutters, we can show you the differences between the materials and help you create window treatments that will work the best for you and your home. Most importantly, At Home Designs is committed to seeing your project through from concept to complete installation. We ensure satisfaction with the entire experience; this is the At Home Designs difference. Explore and compare product options below, and call us to schedule a free design consultation, 302-239-1520. 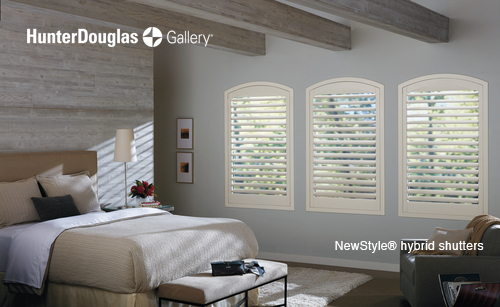 Hunter Douglas Palm Beach™ polysatin shutters are remarkably durable and guaranteed not to warp, crack, fade, chip, peel or discolor, regardless of heat or moisture conditions. If you love the look of shutters but need a streamlined, more durable solution to hardwood, Palm Beach™ shutters are an excellent and beautiful choice. Shutters come in four colors in the DuraLux™ finish, and are very easy to care for.